Hiroyuki Murata, a professor at Tohoku University and CEO of Centre for Studies on Ageing Societies Japan, says that studies have shown that 30-minute exercises three times a week increase levels of a crucial protein called brain-derived neurotrophic factor (BDNF), essential for maintaining healthy neurons and creating new ones. Regular exercise can actually make your brain function like that of a younger person and ward off Alzheimer’s, accelerated ageing, neurotransmitter dysfunction, obesity, depression and schizophrenia. In fact, regular exercise has proven to be more effective than a good balanced diet when it comes to longevity – which possibly explains why some active people can sometimes indulge in fast food while still remaining in excellent health. Prof Murata says there are four key factors to “smart ageing”. They are: healthy eating, regular exercise, steady brain stimulation and active socialisation. Most recently, the Japan Gerontological Society submitted recommendations to the Japanese government to raise the age category of the elderly from 65 to 75. These recommendations are thought to be fair because comparative data show that the average 75-year-old Japanese today is as healthy as the average 65-year-old from about 25 years ago. In fact, many successful and happy centenarians such as doctor Leila Denmark who practised paediatry till 103, chess master Zoltan Sarosy who still played chess at 108, and art critic Gillo Dorfles who published a book at 103, have one thing in common: They liked what they did and continued to work past 100. Research on ageing has come a long way to show how you can stay healthy and happy for 100 years or more. 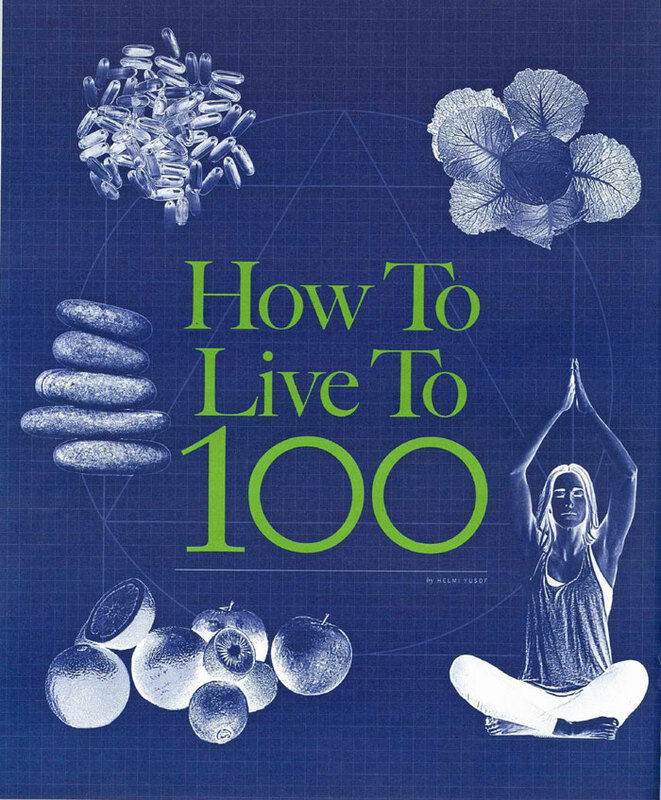 Prof Stuart Kim of Stanford University says that living to 110 and beyond still requires exceptional genes. However, he and other experts agree that diet and exercise can add at least five to 10 years to your life. Here’s some other advice. In a nutshell, take daily five servings of fruit and vegetables daily, three servings of wholegrain foods, and two servings of dairy products. On top of that, take a serving of nuts every other day, oily fish every third day, and green tea, chocolate and red wine judiciously. Avoid sugary foods and processed food. Also, eat less than you have to. Dr Shuhei Kyo of Tokyo Metropolitan Geriatric Hospital and Institute of Gerontology quotes a Japanese saying: “Hara hachi bun me”, or “Eat till your belly is 80 per cent full.” In lab experiments, mice that were allowed to eat as much as they wanted died within two years. Mice that were only allowed 70 per cent of their normal caloric intake prolonged their lives by 25 per cent. Other studies have also shown the benefits of fasting. Meanwhile, a study of the famous “Blue Zones” – places such as Okinawa, Sardinia and Loma Linda where people typically live till 100 – found that their diets consist mostly of plants, especially beans. They eat meat rarely and always in small portions. On the whole, they don’t suffer from heart disease, obesity, cancer or diabetes. The phenomena lasted centuries until the arrival of fast food restaurants and supermarkets in some of these communities. Today, even the Okinawans have seen their life expectancy decline, possibly due to their changing diets. It cannot be said enough: Regular exercise is key to a long life – perhaps even more so than all the other factors. Prof Hiroyuki Murata who heads Centre for Studies on Ageing Societies says that after 20, the body starts to age in different ways – yes, 20, not 40 or 50. And the best way to manage or reverse that is to stay physically active. But it is important to know what your body can withstand. Extreme exercise can put unnecessary strain on your joints. So instead of jogging, many successful centenarians choose walking. Brisk walking can have the same cardiovascular benefits as running. But if you don’t like walking, opt for cycling, swimming or even gardening. Incidentally, activities that involve socialising with other people such as dancing and badminton have dramatically positive. effects on mood and temperament. Just don’t stay home and watch TV – that’s exactly what the Grim Reaper wants you to do. People who need people are the luckiest people in the world, so goes the song. But the song should clarify that they get to live longer too. Women outlive men by about five to 10 years, and 85 per cent of the world’s centenarians are women. There are many competing genetic, scientific and social theories. But the famous psychology-based Terman study says that it has to do with women’s ability to establish strong social and emotional ties with others. (Think for a moment how women are much better at remembering and celebrating birthdays and anniversaries.) The study even found that men with some “feminine” qualities, such as sensitivity and understanding, had happier relationships with their wives and lived longer. (“Feminine” here is not used to connote sexual orientation but personality traits.) “Masculine men” and “masculine women” died sooner than “feminine women” and “feminine men”. Divorced men who stayed divorced had the highest risk of premature mortality. Believe it or not, conscientiousness is perhaps the most important personality trait that could help you extend your life. A groundbreaking 80-year longitudinal study led by Stanford psychologist Lewis Terman tracked 1,500 people born around 1910 and tested them over the course of their lives on a range of traits, from cheerfulness and optimism, to ambition and religiousness. The study found that many of these qualities had no bearing on longevity, except one – conscientiousness. Conscientious people were simply more responsible with their lives. They put on seatbelts when they drove, took the medication that their doctors gave them, planned their finances carefully, and tried to be good and fair to others. Contrary to popular belief, cheerful people died earlier than the conscientious or even fastidious people. Whether these conscientious people were married or single, religious or atheists, shy or outgoing, their longevity was consistent across the board.